Advanced security imaging technology « What Happened to the Portcullis? DebTech is the technology business unit of De Beers, one of the top ranking diamond mining companies in the world. DebTech specialises in the development, manufacture, supply and worldwide support of innovative products and services for applications in diamond exploration, sorting and security. The Scannex full body, low dose, X-ray scanning system was developed during the early 1990s for the primary purpose of deterring the theft of diamonds by diamond mine employees. The Scannex unit has application in many areas where contraband detection is required, such as airports, international sports events, prisons, border control and other high security installations. The system produces high resolution and high contrast full body X-ray images of personnel. A single scan takes approximately ten seconds and the person being scanned remains stationary and is protected from the moving parts of the machine. The X-ray level required per scan is equivalent to that experienced on a two hour international flight. This allows an individual to be scanned up to 200 times per year and still not exceed the US Department of Health recommended safe limit for public exposure. The images are displayed on digital monitors and trained image analysts are able to identify items of a nonanatomical nature that may be concealed on or within the body. To assist in the identification of foreign objects, human anatomical features are de-emphasized in the displayed images. This has the additional advantage of protecting the dignity of the individual being scanned. The display software comes standard with several image enhancement functions to further assist identification of suspect items. The display system is designed such that the viewing monitors can be located remotely from the scanning booth. This not only contributes to the protection of the scanned subject’s privacy but also decreases the opportunity for collusion between the scanned subject,the scanner operator and the image analyst. Up to four monitors may be connected to a single scanner to increase the rate of people being scanned. At the De Beers Namibian operations up to 90 scans per hour have been regularly achieved through one unit. The Scannex system is optimised to differentiate diamond,a material with relatively low X-ray absorption properties, from human anatomical features. This also enables the system to indicate the presence of other materials with similar low X-ray absorption properties, such as explosives, drugs, plastic fluid containers and syringes. 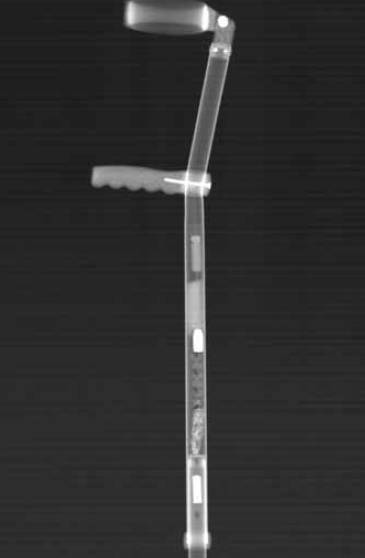 Metallic items, including knives, guns and detonator wire are very prominent in the full body images by virtue of their significantly higher X-ray absorption properties.